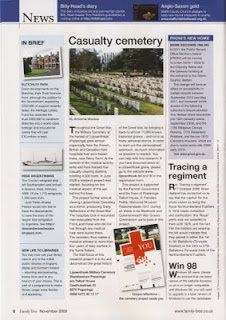 En la edición de Noviembre de la revista Family Tree (www.family-tree.co.uk) de Gran Bretaña, se publicó una breve comunicación al respecto del proyecto de "Los descendientes del Dresden". Tambien, The Maritime Institute of Ireland y el Annual Journal of the Genealogical Society of Ireland difundieron el proyecto. Este es otro paso adelante la investigación para seguir buscando descendientes de estos inmigrantes al rededor del mundo. Sinceramente me pone muy contento, me enorgullese y por supuesto me da más fuerza para seguir adelante. A todos gracias por la difusión. Una de las consecuencias que tuvo este documental fue generar una excusa para que la familia McCarthy volviera a estar junta. Hoy los primos directos McCarthy tuvieron la chance de encontrarse en una ceremonia particular. Aquí, en Argentina Jorge Makarte (McCarthy devenido en el tiempo en Makarte) tuvo la misma ceremonia en la Embajada de Irlanda en Buenos Aires (ver link). Estas medallas no solo representan el valor de Timoteo y Patricio McCarthy en la época de la Segunda Guerra Mundial, sino que hoy representa el vínculo tangible que los une como familia. 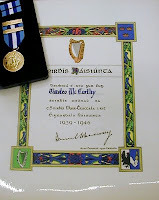 At approximately 12 noon today the Irish Mercantile Marine Valor Medal awarded to Timoteo McCarthy by the Irish government for his service to Ireland during the second world war, was presented by the Irish Government to his grandson Alan McCarthy from the UK. Alan was accompanied by his sister Linda and her husband Brian along with Timoteo's other grandson Peter Mulvany. Sharon McGrath, the Supertendent of the Mercantile Marine Office on behalf of the Minister for Transport, stated that this ceremony was in commemoration of the late Mr. Timoteo McCarthy who had honourable service onboard Irish registered vessels during the Emergency. She went on to say that the debt of gratitude we owe to brave men, like Timoteo, must never be forgotten. Keeping the supply lines open during this difficult time greatly helped to minimise the sacrifice the people had to endure. She added this is something we must not forget. Timoteo and his brother Patricio both from Balcarce, Buenos Aires, are the only Argentine nationals to have served on Irish ships during the Emergency. Patricio was lost on the Leukos and is also honored as being the only Argentine to have lost his life while serving on Irish neutral vessels during the second world war. Also present was the President of the Maritime Institute of Ireland, Mr Eoghan Ganly and Mr Clement McGann Council member of the M.I.I. http://www.mii.connect.ie/. The President of Ireland, Her Excellency, Mrs Mary McAleese, is Patron of the Maritime institute of Ireland. On Friday 9 October 2009 at approximately 12 noon a unique presentation to the grandson of Timoteo McCarthy will take place in the Mercantile Marine Office of the Department of Transport, Leeson Lane Dublin 2. 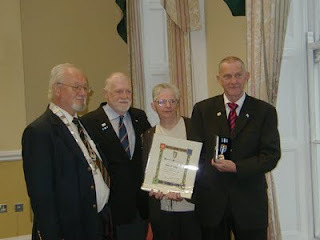 Alan McCarthy from Wallasey in Cheshire, England, accompanied by his sister Linda along with their cousin Peter Mulvany, will be presented with a Mercantile Marine service medal awarded to his grandfather Timoteo McCarthy who served with honour on Irish Merchant vessels during World War two. Timoteo and his brother Patricio who lost his life during the emergency were Argentine nationals. This presentation is in recognition of the service of the McCarthy family and for the sacrifices they made while carrying out their duties onboard Irish ships during the Emergency period. Patricio [Patrick] McCarthy and his brother Timoteo [Timothy] McCarthy were born in Balcarce, Mar Del Plata, Buenos Aires, Argentina in 1897 and 1895 respectively and farmed in Balcarce, an area approximately 60km West of Mar Del Plata. Both Timoteo and Patricio were brought to Ireland in 1905 and ended up in the Sacred Heart Home Drumcondra run by the Sisters of Charity. 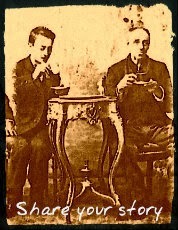 In 1906 they were sponsored by the St Vincent de Paul Society and sent on to St Vincents Orphanage, Glasnevin in Dublin. Spanish was their spoken language at the time. Later on both went to sea. Patricio McCarthy served on the Irish registered fishery protection vessel Fort Rannoch before he lost his life on the steam Trawler Leukos on the 9th of March of 1940. He is the only Argentine National to have lost his life on an Irish Registered Vessel during World War 2. Timoteo [Timothy] McCarthy served on the Muirchu during 1939 until the handover to the Irish Department of Defence on the 10th November 1939 and later served with honour on Irish Ships throughout the War years. Both Patricio and Timoteo are the only Argentine nationals to have served on Irish registered vessels during the emergency. On Sunday 24th February 2002 the Irish marine valour medal with 3 bars and citation, awarded posthumously by the Irish Government to Patricio (Patrick) McCarthy, lost as a result of belligerent action, 9th of March 1940 on the Irish steam trawler Leukos, was presented to his next of kin, Mr Peter Mulvany. by Mr Hugh Byrne TD, then Minister of State for Marine and Natural Resources. The Presentation of citation was by his Excellency, Mr Victor E Beauge, Ambassador of the Argentine Republic to Ireland. In his speech the Minister highlighted the nautical ties that exist between Ireland and Argentina and paid a special tribute to the role of Admiral William Brown from County Mayo, an Irish citizen, who founded the Argentine Navy in the 1800s. Napostá is a faraway spot where you will find an abandoned train station and also an abandoned school, in the middle of large extensions of cultivated fields. It is less than 30 km from Bahía Blanca. Heading south five kilometers there’s another abandoned spot with a train station and a “puesto”, it is called “La Vitícola”. They both have something in common: They are the only silent witnesses of the Irish Colony that existed in this location and which subsequently failed disastrously. On February 15th 1889, the SS Dresden arrived in Argentina with the largest batch of Irish immigrants: one thousand and eight hundred passengers. A few days before it’s arrival, a commission was formed with the most influential persons within the anglo Irish community, just to take care of them, as it was felt that the National Government (Argentine) was not prepared for such a big contingent of immigrants. They understood that the immigrants might be sent to form a colony near Bahía Blanca, a proposal made by Peter Gartland. They pass the night there and early next day, they walk their way to where the directors of the society La Vitícola had chosen to establish the colony. From the outset the immigrants were established in a camp, that is to say, all eight hundred immigrants had to live under tents for, at least, two months. It seems that up till April 1889, the immigrants themselves were the ones who built the houses, and because of a lack of construction experience, the company then took the decision and hired two important firms to do the work. Their new homes consisted of wood houses with only one room and were much better than the tents. After the houses were built in June 1889 each family was put in legal possession of a small farm. These are the only clues that we have up till now about the death records. We know that many people died in the Irish colony, particularly infants, however because of a paucity of contemporary documentary evidence it is very difficult to establish all the facts. Consequently, there is much work and research to be done now and in the future. If you take a look at the area where La Vitícola was located using Google Earth, you can see there is nothing in this vicinity. No town, no reminder in any way showing what this camp would have been like. Indeed there is no physical indication of the existence of the Irish Colony anywhere, not even a cemetery. Some questions spring to mind. Who were these immigrants that died in La Vitícola ? What was their names ? Where did they come from ? They might have had family and may have surviving descendants who would be unaware as to where they are and the appalling conditions they endured ? Where are the remains of the deceased immigrants located, so that they can be remembered with honour by their families ? Who knows, may be a memorial could be erected for them ? One hundred and twenty years have now passed since the arrival of these immigrants to the “páramo” of Napostá. It seems the dust and historical amnesia of past generations has now buried them once again. This is article is dedicated to recover their memory.